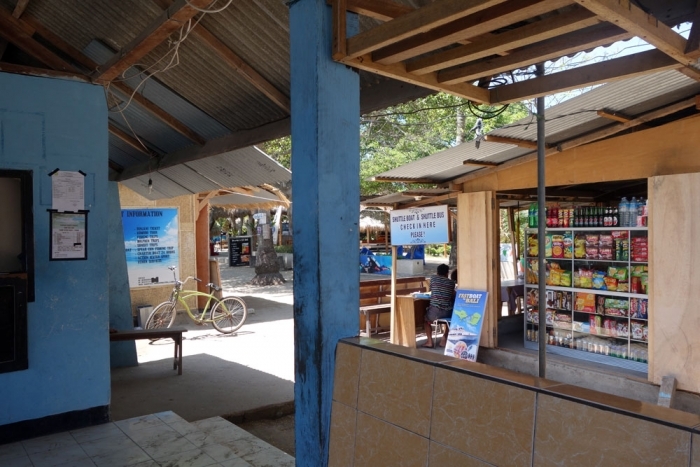 After our 5 days in Gili Air, it was pretty much time to leave Indonesia altogether. We decided to give ourselves 2 days to get to the airport as we weren't quite sure how reliable transport was going to be. With that in mind, we booked one night's stay in Senggigi and then our final night's stay in a hotel near the airport which offered free airport transfers. 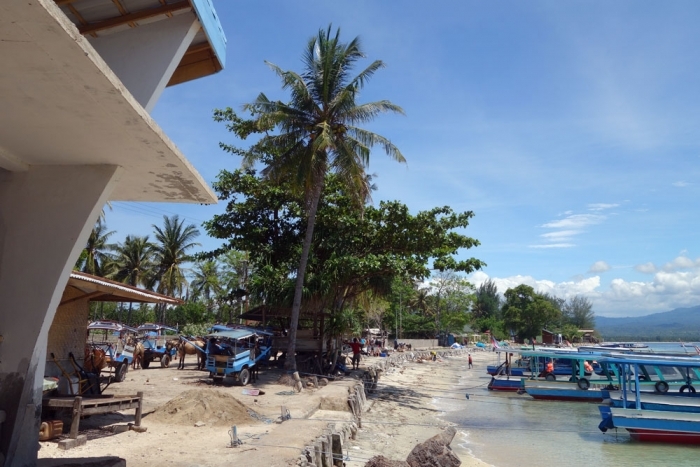 Our first hurdle in the journey was getting off Gili Air and getting to the mainland of Lombok. We had read a lot about the route and how Bangsal harbour has some pretty nasty touts (although everything seemed to be much worse when going from Bangsal towards the Gilis as opposed to our direction) but felt that having done our reading and research we shouod hopefully be OK.
We walked from our hotel to the harbour area just before Midday and found the little office which belongs to the public boats (it is just at the start of the big pier). We paid IDR 12k each for a ticket and were told to sit in what looked like a waiting area. The last photo we took this day before Alistair's memory card disconnected and didn't record more - oops! Finally there was an announcement over a tannoy system that mentioned the word 'Bangsal' and everybody sitting around us got up so we decided that this must be our cue to follow them! The public boat is a long wooden, slightly rickety thing with seats along both edges. We were the only foreigners on the boat and unfortunately all of the locals had beat us onto it and were sat under the small amount of shelter the boat had and so we were left sitting in the baking sun for the journey (which was only about 20 minutes so not too bad). The crossing was pretty smooth that day thankfully and we reached Bangsal Harbour without too much trouble. One thing to be aware of it that when getting off the boat, there is a lot more sea than when you get on! We had to step off into knee high water and poor Alistair with his walking shoes on got fairly wet. 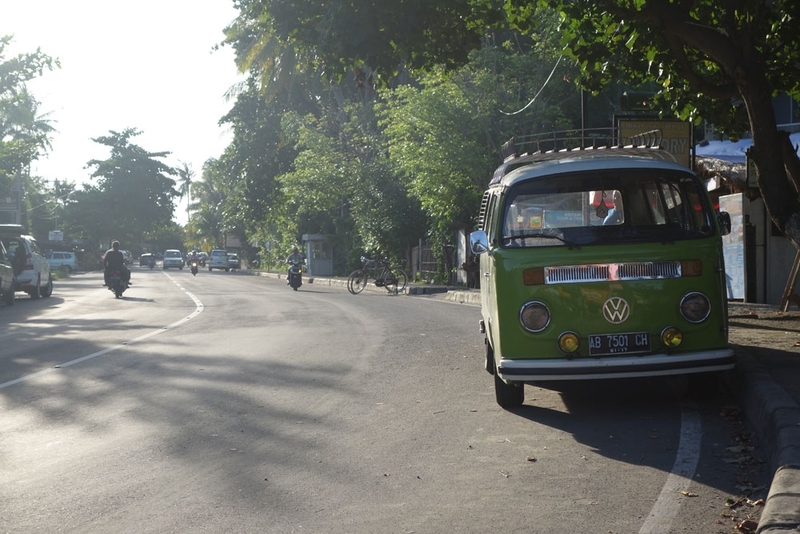 Now that we had made it off the boat, it was time to find a taxi to take us to Senggigi. We had read that the people who run the harbour have barricaded the road into it so that only touts etc can get their cars down. Having read about this before-hand we knew that the best thing to do is to walk up the main road away from the harbour to the barrier, beyond which you can usually find the legitimate Bluebird Taxis. As soon as stepping off the boat we had a couple of people coming up to us asking where we were going and if we had transport. Our hotel on Gili Air had advised us to ignore these touts and tell them that we had transport already sorted. When we said this however, one man in particular starting asking to see our transport ticker and when we ignored him he started calling us liars and walking beside us as we tried to get to the road. He felt a little hot-tempered compared to other touts that we had seen and I was glad when he got bored and decided to leave us alone. Some locals decided to get horse and carts up to the barrier (I'm not sure how much this costs but I'm sure the tourist price will be fairly high) but the walk was only about 10 minutes so not too bad. We still had people asking us if we wanted a taxi on the road up but they were easy to say no to. Once past the barrier we could see some white and yellow taxis waiting for passengers but no Bluebirds. We decided to set our bags down, get a drink and find the address of our hotel on our phone. A couple of the white taxis asked if we wanted transport but we asked them to give us a minute to rest and we would come to them if we wanted transport and they sort of hovered near us but stopped pestering us. It was at that point that a non-uniformed man walked up to us and started asking where we were going. I personally find this practise quite rude and invasive and it happens a lot in Indonesia. 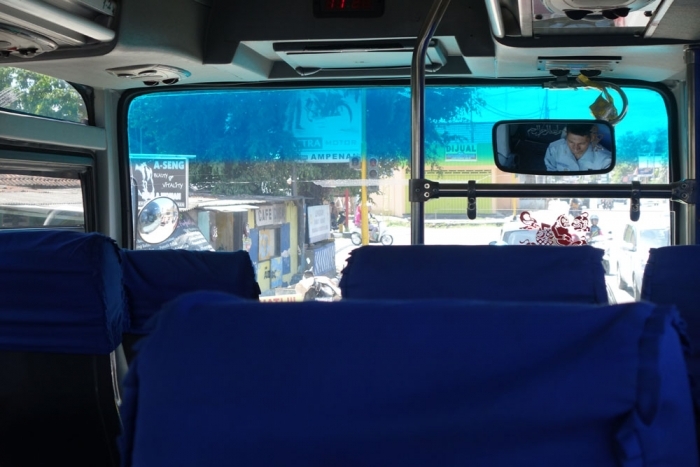 We usually do not disclose our destination to these random pesky strangers and politely say 'no thank you, we are OK' because they are usually looking to offer transport. This man was a lot more persistent though and when we wouldn't tell him where we were going, only that we were going to get a Bluebird taxi he lost his temper a bit. He started telling us that in his 'country' it is rude not to answer when people ask you a quesiont (although I wonder if this would extend to us asking about his credit card pin). When we continued to evade the question he lost it and started shouting at us to 'get out of his country quickly' and that we 'weren't welcome there and just to get out'. We think he meant that the area just past the barrier where the white taxis sit is his land but we didn't try to find out. We figured it best to pick up our things and walk away from him up the road a little more. Turns out that literally 10m further up were a whole load of Bluebird taxis and we were able to hop into one of those and get away from the horribleness that is Bangsal Harbour. Although the white taxis may be legitimate there was something more fishy about them so we were happier to go with the name we knew. Just a note really to mention that there is a bus that leaves from Senggigi to the airport. These are Damri buses and they leave from near the Asmarta restaurant and the art market. They take around 1.5 to 2 hours and at the time of writing it cost IDR35K each way. We got the bus to the airport (which we would be flying out of the next day) and then arranged for our hotel (D'Praya Hotel) to pick us up. They then dropped us back there the next day with no problems at all. Lombok airport itself is fine to go through; No one was too hassle-y and the path is relatively well signposted. The departure tax is collected at a barrier up the stairs after check-in with signs confirming the amount (IDR150k each at time of writing). 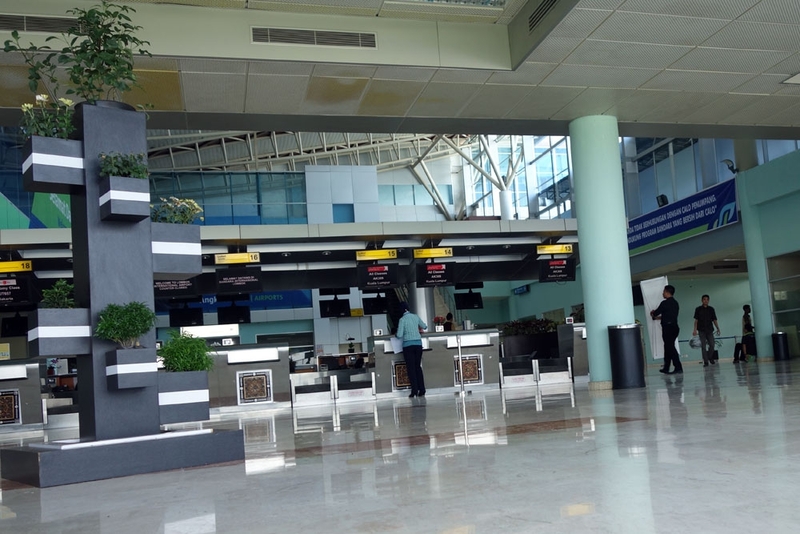 We had none of the trouble we'd read about which happens Denpasar Airport much to our relief! The Air Asia flight was on time and before we knew it we were taking off and saying farewell to Indonesia!